Robert Davis says he’s “lucky and blessed to have the most beautiful drive going to work and home again that anyone can have”, a drive which leads alongside the Little Tennessee River. 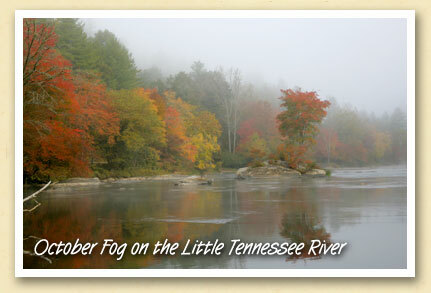 One foggy October morning, he stopped long enough to capture the above image, which later won second place in the Marianna Black Library’s annual “Life in Swain” photo contest. Some of the best views of the Little Tennessee River in Swain County are along Needmore Road. From Bryson City, drive about eight miles west on US 74. At Smoky Mountain Jet Boats, turn left on Needmore Road. Proceed about two miles to the river.